Local and regional buyers snapped up 83% of the lots offered at the 2013 Inglis HTBA Scone Yearling Sale on Sunday at White Park. 146 yearlings were sold at yesterday’s sale for $1,774,000. The average price recorded was $12,151 and median $9,000. 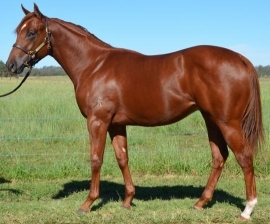 Broadmeadow trainer Paul Perry purchased the top priced yearling at the sale for $62,500, a colt by exciting young sire Northern Meteor from Sirenese that was offered as Lot 104 (pictured) by Jorson Farm. Buyers looking to aim higher with an Inglis yearling are reminded of the new 2013 Inglis Sydney Classic Yearling Sale Winter Book at Newmarket next month. 213 lots have been catalogued for the inaugural Winter Book in Sydney on Sunday 23 June. Inglis’ focus is in Melbourne this week for the three-day Great Southern Sale. 200 weanlings (Lots 1-200) will be offered from 10:30am tomorrow, Tuesday 21 May. An additional 101 weanlings (Lots 201–289 & supplementary 585-596) are catalogued for sale on day two followed by 141 Broodmares (Lots 290 – 430). The final day of the 2013 Great Southern Sale sale, Thursday 23 May, features the remaining broodmares, plus stallions, yearlings, race fillies, colts and geldings, including 62 supplementary entries. Catalogues for the Melbourne Great Southern Sale and Sydney Classic Yearling Sale Winter Book are available online at www.inglis.com.au and on the Inglis Sales iPad app. Online Bidding and the Make-An-Offer Service will be available to buyers that are unable to attend the upcoming sales.